Dr. Naweed Raza is an Assistant Professor in the Department of Otolaryngology-Head and Neck Surgery at Wayne State University School of Medicine. He treats all aspects of Otolaryngology, with subspecialty in Head and Neck Oncologic and Microvascular Reconstructive Surgery. He treats all aspects of head and neck oncology, including cutaneous malignancies, salivary gland malignancies, skull base tumors and mucosal head and neck pathology. He also treats patients requiring advanced craniofacial reconstruction with local and free tissue techniques. Furthermore, he has an interest in thyroid/parathyroid disease, both benign and malignant, as well as disorders of the larynx including vocal cord paralysis and dysphonia. Dr. Raza has presented his research at numerous national and international meetings and has published several manuscripts. He is currently completing his Masters in Public Health at the University of Michigan. His research interests include oncologic outcomes, economic evaluations and surgical ethics. 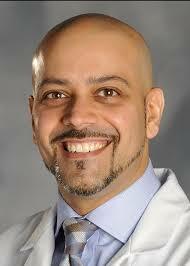 Dr. Raza is the medical student Director in the Department of Otolaryngology Head and Neck Surgery..